Bangkok has a notorious reputation as somewhere to party hard – the city didn’t get its place in films like The Hangover for nothing. But beyond the brash and blaring sights of its infamous go-go bars, and its impressively lavish rooftop bars with views of the city’s skyline, the Thai capital also boasts a collection of smaller, more intimate and often equally unique and quirky drinking holes. Here are a few of our favourites – which one will you drop by? There’s more than just bars: make the most of your visit and get to the heart of Bangkok’s culture scene with one of our expert-led evening tuk tuk tours! Riding the wave of gin’s new-found popularity, Teens of Thailand is set in a tiny, utterly gorgeous restored shophouse on the just as tiny street known as ‘the other Soi Nana’ (so as to avoid confusion with Sukhumvit’s red-light district) on the fringes of Chinatown. It’s around a 10-minute walk from MRT Hualamphong station. Here, a team of Bangkok-famous master bartenders and utter cocktail pros serve up a nightly rotating menu of two or three specials that draw on a wall stocked with countless high-end varieties of gen from around the world. It’s a small, intimate space, and one that many don’t even expect to be open when they chance upon the giant, closed Indian-style door. Come on a weeknight for the best experience and the chance to chat booze with the friendly, knowledgeable staff – either pick from the menu (as well as the nightly blackboard specials, they’ve recently introduced a slightly longer and more conventional menu, including one or two options more accommodating to non-gin-drinkers), or tell whoever’s working what you fancy and have them shake up something unique just for you. This fabulous, European-style neighbourhood bar and restaurant originally came into being in China, where the team behind it already have three branches. It’s a wonderful, laid-back and communal feeling spot that’s open to the street on trendy and affluent Sathorn Soi 12 (only a stone’s throw from the Expique office! ), and there’s truly a European vibe to the space. Le Café des Stagiaires is designed to be a homey, lived-in venue, where there’s a bit of everything going on and where customers become regulars and then friends. And when you’re sipping a cocktail, beer or glass of wine at one of their pavement tables, you could just as easily be in a quiet square in a European capital. A newly refreshed menu has a mix of French, Italian and Asian dishes, and there’s a full range of classic cocktails, plus wines and bottled and draught beers. Another Bangkok bar that first found its feet in Shanghai, The Smokin’ Pug is the lovechild of a husband-and-wife duo hailing from Chicago, and the focus is first and foremost on the food. Expect unadulterated American comfort food: plenty of tacos, pulled pork sandwiches, and huge (literally enormous) racks of ribs – with special mention for the house sauces, including Kansas City and North Carolina, that sit in squeezy bottles on the tables, in a nod to the no-frills, roll-your-sleeves-up kind of attitude that rules here. But The Smokin Pug’ is also somewhere to come just for a drink and a chat with the owners. Pull up a pew at the bar and choose from a menu of classic and original cocktails (we’ve got a soft spot for one of the owners’ eponymous Dana’s Choice), and an extensive range of beers and wines. Pours are generous, the snacks are free-flowing, and the vibe is convivial. It’s worth booking ahead, whether for drinks or dinner, as the place regularly packs out. Sathorn’s legendary Smalls is a late-night bar that pulls in crowds of drinkers turfed out from other local establishments at closing time, as well as a throng of faithful regulars like chefs from some of Bangkok’s top restaurants, pulled in by special deals for hospitality professionals. Run by the man behind what was Sukhumvit 11’s Q Bar, Smalls is a laid-back, dark and moody, vintage and bohemian-feeling venue set over a three-storey shophouse on the corner of Suanphlu Soi 1. A lovely rooftop terrace and gorgeous street-facing balcony are among the vantage points for both drinking and people-watching here, but they close earlier than other parts of the bar, leading patrons downstairs into what becomes a crowded and sociable hive of activity leading up to closing. Smalls hosts regular live music events, drinks are poured in extra-large measures (and the bar has a particular reputation as an absinthe hotspot), and food from the late-closing kitchen gets particular acclaim, for everything from bar snacks like chicken and blue cheese sandwiches, to freshly shucked oysters, and monthly nights devoted to Vietnamese pho noodle soup. Here’s a bar just about unlike any other in Bangkok. Set just off Chinatown’s Soi Nana, a stone’s throw from our other favourite Teens of Thailand (see above), the focus at Tep is on enthralling, high-tempo, ear-piercing traditional Thai percussion performances put on by local music students. Come on a weeknight for a quieter, more intimate vibe when the audience and drinking crowd is sometimes made of little more than you and those students’ university professors, in the bar to cheer them on and lend support. We like to avoid weekend evenings here, when Tep gets packed to the point that entry is on a one-in-one-out basis, which we think spoils the atmosphere that makes this place what it is. Tep is set in a raw-feeling, restored duplex-style shophouse, with gorgeous unfinished walls and a lovely open balcony looking over the bar and stage area below (but to get the best vibe and be up close and personal with the performers, you’ll want to sit downstairs). There’s an extensive food menu of excellent Thai drinking-style small plates and larger dishes, ranging from sun-dried Thai beef to somtum papaya salad and raw prawn ceviche – the truly stand-out food here is worth coming for alone, and deserves a second mention. On the drinks side, cocktails follow innovative, Thai-inspired recipes; there’s also the chance for lao ya dong virgins to get their first experience of this infused local rice spirit by way of potent but pricey tasting shot platters. A short list of beers, and house wines and spirits, is also available. Rooftop bars rightly figure on the itineraries of many a Bangkok visitor, but they needn’t be budget busting five-star affairs. One of our favourite Bangkok drinking hangouts is the unpretentious, mildly grungy Sky Train Jazz Club, on Soi Rangnam in Bangkok’s Victory Monument area (BTS Victory Monument). We’re talking fifth, rather than 105th, floor here, and instead of views of glittering skyscrapers you can expect the rather more down-to-earth lookout over the track of the Skytrain’s Sukhumvit line. But don’t let that put you off – there is cheap booze and a chilled crowd to be found at Skytrain Jazz Club, which is frequented by a trendy, creative mix of locals, expats and increasingly more tourists as word gets out. The best way to enjoy Sky Train Jazz Club is to get here around sundown – it gets busy on Friday and Saturday nights in particular – and settle in for a long night with a group of friends. Order in a bottle of whisky for around 300-500 baht, a bucket of ice and plenty of mixers, and be reminded as to why you love salt-of-the-earth Bangkok as a mix of retro and more recent tracks play (there’s rarely any jazz, despite the name) and portraits of Marilyn Monroe watch down over you. The food is excellent, if significantly pricier than the alcohol and often a tad slow to make its way out of the kitchen – we particularly like the enormous plate of fatty German pork knuckle (390 baht, enough for at least 2-3 to share). Anything retro or vintage is all the rage in Bangkok, and so much the better if it’s the kind of joint where you can basically buy everything you see. Shades of Retro ticks both boxes – this tumble-jumble of a bar is packed seemingly from floor to ceiling with all manner of curios objects: think sunglasses, musical instruments, Vespas and plenty more. This, and all the furniture, too is for sale, so if your cocktail isn’t enough therapy for you, there’s the chance to do a little shopping too. Shades of Retro gets packed with Bangkok’s hipsters when DJs lay on live music, the party spills out onto the street, and the crowd is friendly and up for a chat. 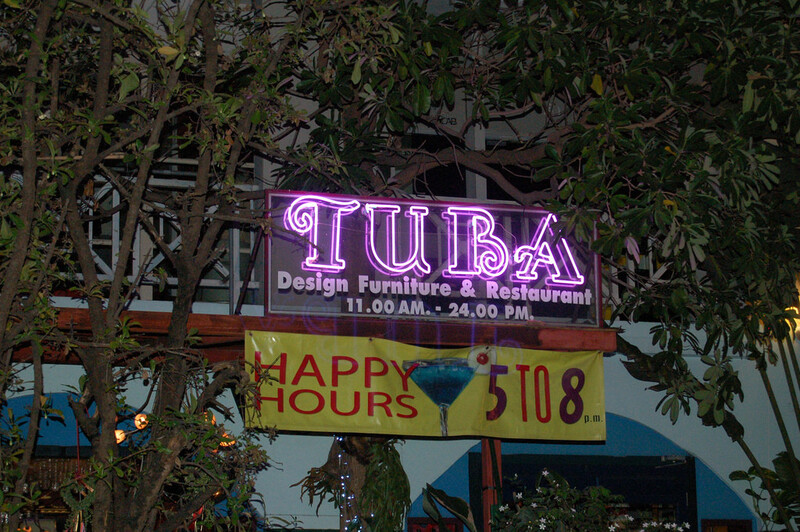 Ekkamai’s Tuba is another spot where the furnishings are for sale, and it goes so far as to include ‘design furniture’ in its strapline. But here there is slightly more order than the haphazard arrangement of products at Shades of Retro, and the place feels like something more of a living gallery – even if it’s a rather eccentric one – the atmosphere is also brighter and rather less grungy. The furniture for sale is mostly 1950s to 1970s retro pieces, while the food in the restaurant is a mix of well executed Thai and Italian dishes, including popular pizzas. Tuba doesn’t disappoint on the cocktail front, either, with an extensive collection on offer. With a name like WTF, how could we not feature this Thong Lor favourite of ours in a list of quirky Bangkok bars? While the name apparently doesn’t mean what you think it does,WTF should definitely be on your drinking list for a trendy, intimate atmosphere with just a few tables, and a solid collection of inventive cocktails, along with craft beers from Oregon. The food menu is updated regularly, and that sadly means that the pizzas we thought they excelled at are a thing of the past, replaced by equally solid Spanish fusion tapas. WTF gets popular on Friday and Saturday nights, when the cool kids spill out onto the street and the place essentially merges with Opposite Mess Hall, just across the tiny soi. On the upper floor, a regularly rotated gallery is worth a wander if you can pull yourself away from the cute, vintage themed décor and the bands that pump out live music around the bar on select nights. UPDATE: As of March 2017, Cheap Charlie’s is now sadly closed. Something of a Bangkok institution and attracting an eclectic crowd of expat and local regulars and tourists passing through town, the stalwart Cheap Charlie’s has been going for decades. This ramshackle little setup, a wooden bar down a small side alley on trendy Sukhumvit Soi 11 (BTS Nana), does exactly what it says on the tin, and the atmosphere here is cheap and cheerful. Expect whisky, vodka and mixers from 80 baht a glass – small glasses, but they’re generous with the spirits – and beers, plus passable red and white wines. Less cheap is the food that comes courtesy of Snapper, the Kiwi fish and chip restaurant just opposite – but their grub is good, as is the excellent Indian fare from the Moghul Room restaurant right on Cheap Charlie’s doorstep. Must-dos while at Cheap Charlie’s include taking an up-close look at the bizarre mix of curiosities that make up the bar structure – think Scalextric-style Skytrain tracks, wasp nests and skulls. If you’re lucky you’ll also catch the on-off break dancing performances from local students that take place in the street right in front of the bar (and involve audience participation, so if you’re brave then step up and prepare to be somersaulted over!). And of course respect the two important rules of Cheap Charlie’s – not stepping across the chain on the floor that is a makeshift land border to the outside world, and not doing a number two in the rather less than salubrious unisex toilet shack – in case you missed them, the signs are quite clear: ‘no s***ting’. Oh, Cheap Charlie’s, we love you. Where are your favourite drinking holes in Bangkok? Let us know in the comments! Photos by Teens of Thailand; Le Café des Stagiaires; The Smokin’ Pug; Smalls; Tep; Chris Wotton; Shades of Retro; Tim Jackson; Krista; smalljude. Want to explore more? Contact us about arranging to come on a custom adventure with Expique.